Many of us are familiar with a living will but fewer are aware of what a POLST form is and its benefits to your family. If you have a loved one who is terminally ill, this is an important document to honor their end-of-life wishes. A POLST (Physicians Orders for Life-Sustaining Treatment) is a legal form that gives extremely frail and advanced progressive or terminally ill patients control of their end-of-life care in an emergency medical situation. 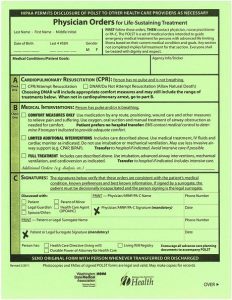 Similar to a DNR (Do Not Resuscitate Orders), but more specific and detailed, this form is signed by both the patient and his or her physician, nurse practitioner, or physician assistant. The goal of a POLST form is to prevent unwanted treatments, reduce patient suffering, and ensure that the patient’s wishes are honored. Printed on colored paper to be easily noticed and seen, the form includes directions for medical treatment, extraordinary measures, and CPR. By completing a POLST form, the person is clearly communicating their decisions to accept or decline life-sustaining treatment or medical intervention in any healthcare setting, especially if they can no longer communicate. A POLST is not for everyone. It is specifically designed for people who are seriously ill. Healthy people should use an advanced directive or living will as a tool to make their wishes known for their future end-of-life care and recommended for all adults regardless of their health status. The big difference is the POLST puts your advanced directive preferences into actionable orders that medical professionals must follow. Why is POLST form different than a living will? A living will or advanced directive is a legal expression of what treatment a person would want in a future situation, whereas a POLST is an active medical order written by a medical professional based on the current condition of a patient. An advanced directive or living will is a speculation of treatment for an unknown future medical emergency. The POLST documentation designates the specific medical treatments your parent would want based on their current state of health. The one thing the POLST does not identify is the person (known as a surrogate) who will make decisions on the patient’s behalf about their care if they are no longer able to communicate. Therefore, the POLST is a compliment in an advanced directive but does not replace it. What is included in the POLST form? The decisions documented on the POLST form include instructions for emergency medical professionals to attempt cardiopulmonary resuscitation (CPR) or not. If your family member is in an emergency situation, you can also instruct what type of intense medical intervention they will want. The patient can request whether they want to be transferred to a hospital, intensive care, use of cardioversion (to reset the heart rhythm), or ventilators to help with breathing. The patient can choose whether to receive antibiotics, hydration and artificial nutrition by tube, or dialysis. Comfort measures are always provided no matter the treatment choices that have been made by the patient. The POLST form is a medical order for care. It is entirely voluntary for the patient, and there is no age limit. The POLST order can be revoked or changed at any time, particularly if their condition changes. What is the process to complete a POLST form? This POLST form helps to facilitate a structured discussion between the patient with their health care professional regarding his or her values, religious beliefs, and goals for care. The POLST form also allows patients with strong religious convictions to have those values honored in an emergency and across care transitions. The medical professional will walk through the patient’s diagnosis, prognosis, and treatment options, including the consequences of life-sustaining treatment. Together, the patient will reach an informed decision about the desired treatments outlined in this form. Every state that has a POLST form generally covers much of the same information, but the names of the forms may differ. Most often called Physician Orders for Life-Sustaining Treatment (POLST), the form is also called in some states: Physician Orders for Scope of Treatment (POST), Clinician Orders for Life-Sustaining Treatment (COLST), Medical Orders for Life-Sustaining Treatment (MOLST), Medical Orders for Scope of Treatment (MOST), or Transportable Physician Orders for Patient Preferences (TPOPP). Some states may have reciprocity with other states, but it is safest to fill out forms from the state that is relevant to your loved one. Depending on what state they live in or applies to them, they can either download the form to fill out with their physician or get a form from their doctor. POLST forms can be completed by either a physician, nurse practitioner, physician assistant, social worker, or other medical professionals along with the patient. To be legal, this form must be signed by both the patient and a medical professional. Where to keep the POLST form? The original documentation should remain with the patient – whether that is in their home, assisted living community, nursing home, or hospital. Once the form has been completed, make a copy for the primary caregiver, family members, and doctors. Let your family and caregivers know where to find the completed form. If you have a family member that is still living at home, this form should be displayed prominently where it can be easily seen by medical personnel who may enter the home—next to their bed, on the door of their bedroom, or even on the refrigerator. In the case of an emergency, legally-required procedures by emergency personnel will be overridden by the directions on the POLST. Medical professionals must honor POLST instructions wherever the patient is — hospital, assisted living community, nursing home or private home. If they do not see the POLST form, they will follow standard procedures to provide life-sustaining treatment. This is why these are often printed on bright pink paper, green or another vibrant color to be easily seen. If your parent is in a hospital or medical setting, the original POLST form should be attached their medical chart. Assisted living communities will keep the POLST form in their medical files. The POLST form is intended to go with your parent from one healthcare setting to another to ensure consistent care that honors their decisions. If your loved one is terminally ill, discuss the option of completing a POLST form with your parent and their physician as an important step to honor their wishes.